Supai, Arizona is a breathtaking, intriguing place, and no one at TDS knows it better than Field Service Network Specialist Paul Amick—he’s serviced the area for almost 30 years. 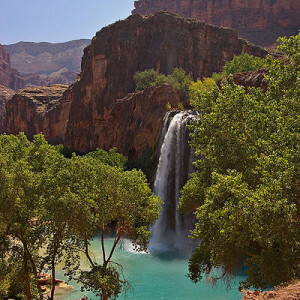 ​Supai is a small tribal community of about 600 people located at the bottom of the Grand Canyon. This remote location requires Paul take a helicopter down to help customers. Although it’s now routine for Paul, he said it is always quite an experience to fly eerily close to the canyon walls, see the canyon floor packed with horses and hikers, and occasionally fly around the nearby waterfalls. Once in Supai, Paul is responsible for about 175 phone lines. Paul said he does everything from dig trenches to bury cables for installs/repairs, to taking care of all the outside and inside plant facilities. He also spends time servicing his Polaris Ranger, trencher, and portable generator—all work equipment necessary for the community. Some of these duties are fairly standard, but some of the challenges of working in such a unique area are definitely not typical. Paul said there are many challenges, but some he comes across often include: being unable to fly into the canyon due to heavy cloud cover, waiting hours for materials to be shipped in, and being hurried to fix an outage because the helicopter is ready to leave for the day. Paul also said he has to bring more materials and tools with him to the job site in order to avoid multiple long trips. However, there are many positive aspects of working in Supai as well. Aside from the ability to say he works in the Grand Canyon, Paul said he loves getting to know the people, their lifestyle, and their culture. He also doesn’t mind the opportunity to take the two mile hike to see the beautiful waterfalls in the area. Of course, by servicing such a one-of-a-kind market, Paul has definitely accumulated some memorable moments over the years. He said he won’t forget what took place when Supai’s system included open wires. To fix a problem, Paul had to follow the wire from cliff to cliff. While he was working, a mountain sheep—a ram with fully curled horns—crossed in front of him, stood there, and kept watch. After Paul went down the canyon to continue to work on the issue, the ram was standing there waiting for him when he returned to the top. It continued to follow him along the cliffs while he did his job that day. This was especially memorable for Paul because of what rams mean to the tribal members. The Supai village has about one of everything, including a café, store and post office, K-8 school, a clinic, two churches, and a lodge—where Paul has stayed over the past 30 years. Over this span, Paul has become passionate and knowledgeable about the village. Paul encourages others to check out the area he has grown so fond of. “It will be something you remember for a long time,” said Paul. Image of Havasu falls by moondigger.